This is the fifteenth book in the Marcus Didius Falco historical mystery series. Fans of "informer" Marcus Didius Falco will be glad to find the classical world's answer to the modern-day gumshoe back in Rome in Davis's stellar historical, the 15th entry in this witty and learned series, after two adventures set in Britain (A Body in the Bathhouse; The Jupiter Myth). In an effort to resume his career as an informer on his home turf, Falco ends up playing advocate in a messy dispute that pits him against two highly successful "legals," Paccius Africanus and Silius Italicus. 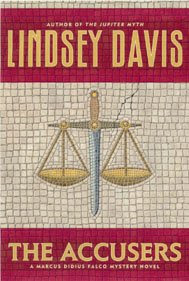 The convoluted case, which involves a wealthy, fractious family and tricky questions of inheritance, gives Davis the opportunity to explore the vagaries of Roman law, which she approaches with her usual mix of respect and sarcasm. The corruption conviction of senator Rubirius Metellus followed by his mysterious demise threaten the Metelli family's fortunes. Hired to prove the senator's death was not a suicide, Falco finds himself immersed in scandal, blackmail, corruption and intrigueâ€"common ingredients of legal practice. In one particularly fine scene, Falco delivers a speech in the Basilica that relies on amusing and effective rhetorical tricks. Wry, cynical and principled, Falco makes the perfect guide to Davis's vividly realized ancient Rome. I adore Marcus Didius Falco. His lady love, Helena Justina, also is one of the few female characters in literature to make it onto my "Heroines Who Don't Annoy Me" list on the left. (Some may think that I have forgotten this list exists and thus have not updated it for a very long time- this is not the case. I just haven't found any other girls who wow me.) I also love their motley assortment of relatives, friends and hangers. The cast of recurring characters seems to increase with every novel, and some will disappear only to re-appear later on, or be mentioned in passing- Davis clearly keeps a very detailed list, and it is a delight to her readers. I also love how alive Davis makes Ancient Rome. It is easy to view Rome with a certain sense of awe, as though just because their citizens wore togas and spoke in Latin and built impressive structures, that they must surely have faced far loftier situations than those with which we mere mortals of the 21st century must contend. I never really know how to review mystery novels without giving away the plot. Also, as this is my fifteenth Falco book, I can't say much about the characters that I haven't said before. It has been a long time since I visited Marcus and Helena and Petronius and all the others, but I picked up the book and felt right at home. In fact, I am going to pick up the next book in the series as soon as I finish this review (sadly, I am almost at the end... luckily, Davis is still writing them!). It is a series I feel so comfortable reading, and which I can always be sure will make me laugh and relieve some stress, for as long as I am reading it. And really- sometimes, that is all you would ever want from a book. So, if there is anyone out there who still hasn't tried this series... what are you waiting for? You're in for a fun ride! I am only up to book 3 myself, but I do really like this series - the combination of historical mystery and gumshoe detective really works for me! I kinda can't believe I haven't found this series yet, but after reading this I will be looking for it! Wow! You are reading way more this year than you did last year all ready! I know, Kelly! I have already, depressingly, read about a third the number of books I read in the entirety of last year. And a fifth of the total for 2007. So- I think I am on a good course right now (though it's easy to sit inside and read books instead of socializing during the winter months).